Staying strong when the temperature starts to drop. Though Maine falls are postcard pretty, it can be hard to exercise outside in the autumn air once that north wind starts blowing. You can still get all the fresh air and Vitamin D you need outdoors, if you’re willing to dress for it. Here are a few ways I’ve found to beat the fall chill while training for a marathon in our cool climate. No, I’m not joking. 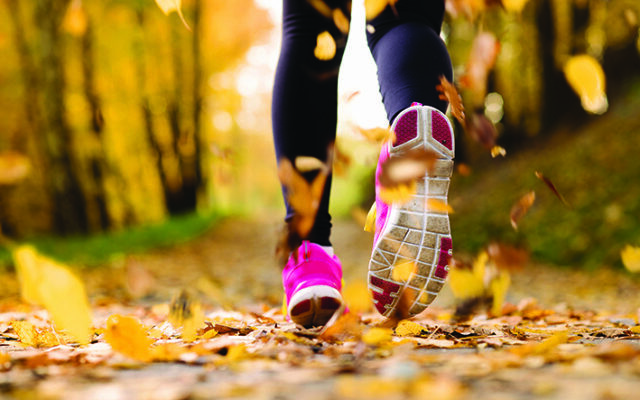 You can run, walk, jog or wog (a cross between a walk and a jog) outside straight through autumn. How do I know? I’ve been wogging for 11 years now, and I’ve yet to encounter a fall day too cold to wog in. Rural routes provide a nice gravel shoulder for those who need a little give beneath their feet when they’re pounding the pavement. Nothing beats running on a quiet country road, leaf-peeping all those orangey-red trees while singing along to Adele’s “Hello From the Other Side.” It puts me in the mood for heartbreak and apple cider simultaneously. Or, if you’re a Bangor city dweller and too far removed from rural routes, you can hit the sidewalk or the slow lane and still belt out any number of Adele’s rock anthems. Just avoid the interstate (a lot of crazy scenarios involving last minute dives and handsome young paramedic workers come into play there). Stay safe on country roads, sidewalks or slow lanes, “Set Fire to the Rain” and keep those thoughts of hot EMT’s coming! Let’s start with footwear first. It’s brisk all right, but if you throw on some warm socks you’ll be all set. Smartwool socks are great. Unless we’ve had a rainy week, your feet will stay warm and dry 95 percent of the time. You don’t need special sneakers — just plain old running shoes. As far as outdoor gear goes, don’t go heavy. Any thin, breathable long t-shirt will do. Then, it’s all about layering, starting with the thin layers on bottom and fleeces and/or windbreakers on top. Even on our “Is this the beginning of winter already?” days, you’d be amazed how warm you’ll feel after that first mile with only a long t-shirt, a sweatshirt or a light jacket on. When the weather does start to turn, a normal pair of cotton gloves and a hat will work just fine. I wear an oversized wool hat my mother-in-law knit a decade ago and some old ski gloves my husband thought he lost in college. The brown hat doesn’t match the bright turquoise gloves (yes, my husband wears turquoise) but it’s not about the look. It’s doubtful you’ll run into Dr. McDreamy on your run. Dempsey probably only comes home in the summer, and even then, I don’t think he travels much past Portland. You may be thinking, “Is all this running outside really good for me?” Let me tell you, I am no Amazon. I spend most days near a wood stove with a warm rice bag in one hand and a hot cup of coffee in the other. I’m not some crazy fitness fanatic who thinks the key to inner peace is inhaling lots of chilly air and breathing out steam. If you’re a sissy like me, throw a scarf around your nose and mouth to warm the air as you go, and you’ll be breathing free and easy every step of the way. As long as the windchill doesn’t drop below twenty (it’s rare but it’s Maine, people) we’re good. Protect your skin and your lungs with a layer of warmth and you’ll stay toasty, I promise. Cross-training days are a godsend. If you run, walk, jog or wog for a half an hour five days a week (a solid workout regimen for just about anybody short of an Olympian) cross-training day is a blast. Usually it’s a blast of warm, sweaty air, but it’s worth it. I use my husband’s indoor bike trainer (a holdover from his triathlon days) and hop on my mountain bike while looking out the picture window in our living room. And when that view gets old (minute two) I turn on Judge Judy and watch that lady take zero crap from zero people. She’s amazing. Stationary biking, spin classes, swimming, rowing, stair-climbing, aqua-jogging, kick-boxing, Zumba, Latin dancing, just about anything can be great indoor exercise. If you want to get your groove on and do some Just Dance on your Wii, go for it. Hula hoop while watching a chick flick. Hop on an elliptical or another indoor exercise machine if that’s your style. Cross-training is all about strengthening muscles you’re not using as much during the week and letting other muscles rest. Speaking of rest, you’ll like this part. On the seventh day, take a break. In the name of all that’s holy, start the day with a donut, eat pizza, hydrate with wine and don’t skip dessert. Reward yourself. You don’t have to go overboard laying in bed all day snacking on bon-bons, but chances are you’ll find yourself snacking on more veggies than chips and wishing you could just take a 20 minute walk. Ignore those urges. Really. Rest. Relax and give yourself permission to indulge in the downtime and empty carbohydrates you’ve been craving all week. If you look at the research out there, you’ll see that science backs up a day of rest. Muscles need time to build after the wear and tear of the week. If you wear them down too much, you risk a tear. Also, you don’t allow them a chance to build up. If only science would get behind the empty carb loading and copious wine consumption life would be perfect. This is the beauty of staying fit, whatever month you’re in. You can mix and match what works for you here. If you want less time outside, then add more cross-training days inside. If being inside is driving you stir-crazy, then find an apple orchard or pumpkin patch near you and get picking. Hiking is a nice option this time of year if you like that “I just Maria von Trapp’d this mountain” feeling. I’m always trying to work my core but would rather not spend lots of money on a gym membership (or on infomercials selling abdomenizers) so I throw down an old beach towel and crank out sit-ups. One hundred sit-ups a day (four sets of 25) works for me, but every belly is different. I have a marsupial pouch from three baby joeys. That’s what I’m working with. In between my four sets of sit-ups, I bust out 10 push-ups. This only takes seven or eight dreaded minutes, tops, but I feel so strong when they’re over. Let’s face it, if you’ve read this far, somewhere deep inside, you want to feel fit and strong, too. Not to impress your sister, not so your colleagues will notice you, not even so your partner will find you more attractive. Those are all the side-benefits. The main reason to stay in shape this fall should be obvious by now: rest day, my friends. You get to eat all those delicious carbohydrates and drink your calories guilt-free once a week. I will stationary bike until the mountain in the window gets closer than it appears for my weekly donut run. Now that’s a run I can get behind.